They are nothing like the long straight pods that this variety produces when at the height of its vigour, but they are still worth having. As I wrote in my Harvest Monday post this week, I took down the "Cobra" beans and their supporting bamboo canes on Saturday, because a very severe storm was forecast. In the process of doing this I naturally harvested all the remaining pods of a useable size. They amounted to 200g, just about enough for a 2-person serving, I reckon. So that's it for another year, as far as my beans are concerned, but I shall definitely be growing them again next year and it would take a lot to persuade me that "Cobra" is not the best variety to grow! My first impression of the book was that it was in "diary style". It has a hardback cover, a built-in ribbon bookmark and an elastic band arrangement to keep it closed when not in use. It seems durable, and on closer inspection it is evidently intended to be taken to one's plot and used there, rather than being left at home. I had also expected (from the title) that it would be arranged in a month-by-month format, with jobs to do on an allotment arranged in chronological order. Although it is roughly like that, this is not a dominant feature of the book. Instead the book is really a list of ideas for things to do on your plot (or related to it) arranged only very vaguely in seasonal order - for instance the "Build a bonfire" subject appears in the September section, whereas I would have expected it to be in the November one (Guy Fawkes' night / bonfire night? ), and the "Plant a herb garden" bit is in the December section! Thinking further about this, I'm not sure if there is any real logic to the order in which the subjects are addressed. and it is a very wide range of subjects, ranging from "Share your plot with the world" (about blogging, in other words), through "Crack down on crime" (ways to deter or reduce allotment-related crime and vandalism), to "Get qualified and learn Latin"! Now whilst the list of subjects covered is impressive (200 different ones, presumably), the depth of coverage is disappointingly superficial. No-one can really do justice to the subject of "Avoid the glut" in less than one page. I think the reader of this book will have to see it as simply a list of ideas that will need to be researched more fully elsewhere. The book contains a number of nice photos chosen to illustrate the subjects covered, but with a few exceptions (e.g. "Building raised beds"), they are of a cosmetic nature rather than a practical one. I feel that the claim on the back cover that with the aid of this book you can "Find out how to grow the tastiest crops, keep the busiest bees, produce the largest pumpkins and make your own jam and wine" is very over-optimistic. It is definitely a book for the beginner and not the expert! 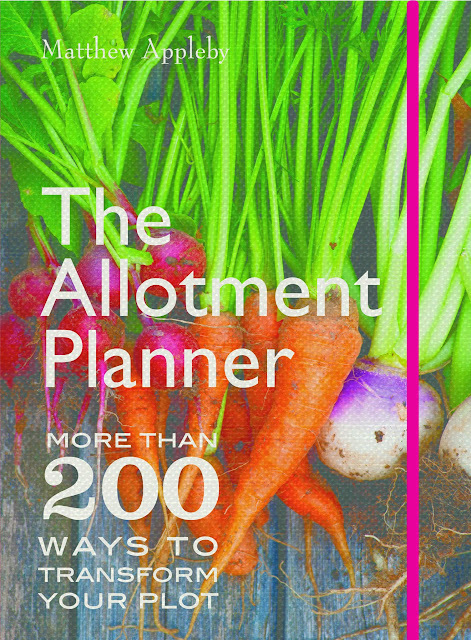 To order The Allotment Planner at the discounted price of £12.00 including p-and-p* (RRP: £14.99), telephone 01903 828503 or email mailorders@lbsltd.co.uk and quote the offer code APG34. If you would like to have my review copy of this book, please leave me a comment ON THIS POST, including the words "Allotment Planner", before 12:00 on 5 November 2013. The winner will be chosen at random from all qualifying entries and notified via this blog. Well, it's just about November, and we still haven't had any frost, so I'm continuing to harvest a few things from my garden. One of those things was my first really decent "Garnet" Sweet Pepper. About a month ago I had a couple of these ripen, but they had been attacked by some sort of bug and were not useable, so this is the only good one I have had so far. There are lots more on the plantsl, but they have proved to be very slow at ripening. Isn't it funny how getting one lovingly-nurtured and long-awaited good specimen sometimes seems so much more of an achievement than a glut﻿ of something that is easy and predictable? I took down my "Cobra" climbing French Beans and their poles, on Saturday. There were lots of tiny pods on the plants still, but I wanted to take down the bean poles before we got hit by the first really bad storm of the Autumn. These last few pods are very small, and individually not fine specimens, but collectively they make a viable harvest. It amounted to just over 200g. The ones in my photo look (and are) fine - very nice tight sprouts - but unfortunately about a quarter of the ones I picked had been spoiled by maggots and were not edible. This is a real shame, because this particular crop is another long-awaited one, and the sprouts looked so good from a distance! Anyhow, the good ones still added up to 400g. As usual I have also been picking chillis. The basket of them in the airing-cupboard is nearly full now. As you can see, I'm still getting a few tomatoes. Those ones are "Sungold". There aren't many more to come, but I'm savouring every one. The vast hoard of tomatoes on the Dining-Room table is dwindling rapidly now, but we'll still be eating home-grown tomatoes in November, that's for sure. The "Autumn Bliss" Raspberries continue to produce a trickle of ripe fruit. It's never enough to do anything much with, just sufficient for a garnish to a bowl of ice-cream or something. To finish off my post for this Harvest Monday, here's another photo of that "Garnet", alongside one of the "Cyclon" chillis. The "Garnet" is about 8 inches long. The tomato pots really did a good job! I'm glad I hadn't got round to emptying them. This year the Autumn has so far been very mild. We have not had a lot of strong wind or heavy rain, and the temperature has not yet dipped very low (still no frost here, for instance). This is all set to change tomorrow or Monday, according to the weather forecast, with a big storm making its way towards us across the Atlantic... For the time being though, we have one more chance to enjoy the Autumn colours before the leaves finally get ripped off by the wind. If I find the time to do so, I think I will take down my last lot of bean-poles - the ones supporting the faithful "Cobra" French Beans. If I don't, I expect the gale will take them down for me! My Blueberry plants (I now have six) are all "freebies" from magazines - ones for which you only pay Post and Packing charges. Some of the plants I have acquired in this way have been surprisingly good. Definitely not "clearance stock" rubbish. Next year I hope to get my first few berries from a new one called "Pink Lemonade", which produces pink berries instead of the normal dark blue. Should be interesting. I have read recently that Blueberries do best if their roots are not too cramped, so in the Spring I shall be re-potting a couple of mine which have grown a lot since I first got them. A basket case? Making the case for baskets. 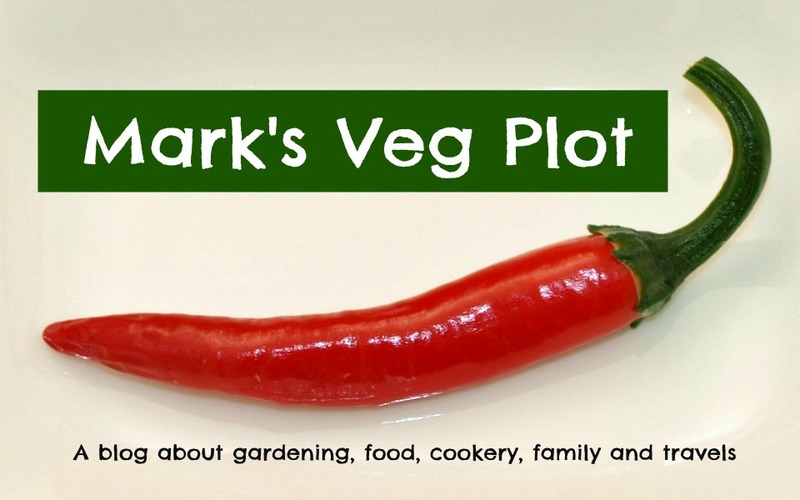 If you are a regular follower of my blog you will know that I am keen on presenting photos of the fruit and veg I grow in an attractive manner. There is a place for the "natural" look - with freshly-harvested veg still covered in earth - but I think there is something particularly appealing about presenting produce neatly arranged in baskets. Because of this I have a growing collecton of baskets in a range of shapes and sizes. Although I did once splash out £15 on a wicker basket that I particularly liked, my usual source of such things is the charity shops (of which there is a large and growing population in our area). Of course, you can't count on being able to get any specific type of basket in a charity shop. You just have to keep your eyes open and get in quick when you see something suitable. The baskets I have bought from charity shops have always been very reasonably priced too. The three pictured above were £1 each. In retrospect I wish I had handed over a bit more money, because it goes to a good cause, and it seems a real shame to see such beautiful items sold so cheaply. Take a close look at the one at the back, with handles. It's a work of art! This is my £15 basket, bought from Mole Valley Farmers. It's marketed as a shopping-basket, but of course it has never been used for that purpose. Since I had bought it via mail order from a place in the West Country, and I fully expected it to have been made in England. I was disappointed to find that it had been imported from Romania! To my mind, a hand-made basket (even if mass-produced) looks 100% better in front of the camera than a tatty old plastic washing-up bowl, but I do have to admit that a plastic bowl is easier to keep clean! I wouldn't want to wash my baskets too frequently, so I tend to use the plastic bowl for the actual harvesting, and then put the veg into the basket for the photography session. It's just not the same is it? I suppose the ideal solution would be to use something like the traditional Sussex Trug which, being made of wood, is washable as well as being attractive to the eye. Leaving aside baskets for a minute, I think that natural materials look so much better on almost every occasion when it comes to fruit and vegetable photography. In my opinion, these radishes would look just that little bit less appealing if they weren't presented on that beautiful olive-wood board. What do you think?? At this time of year, just before shedding their leaves for the Winter, the Dogwood shrubs put on an amazing show of colour. I have several different Dogwoods, and their leaf colour varies a lot. Even on one plant there may simultaneously be leaves of several different hues. 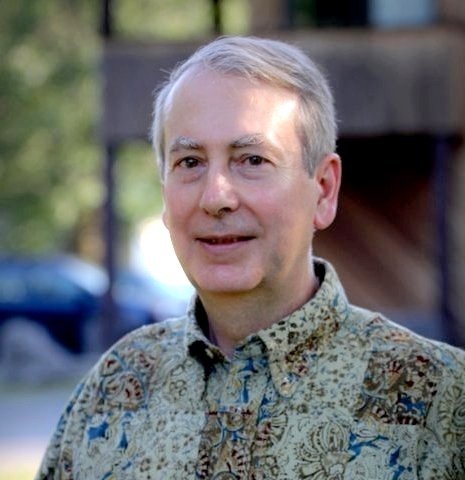 There is little for me to write in a post on this subject. All I need to do is show you the photos! Perhaps the best thing about Dogwood is the fact that after the leaves have fallen you get a second display of colours, in the stems.﻿ I'm sure I'll post some photos of those when the time comes...! Is Lettuce for Summer only? Who can give me some recommendations for varieties of Lettuce to grow outdoors during the Winter in the UK? I have some cloches which could be used for protecting them, but no greenhouse or polytunnel. Last year I grew some "Winter Density" and some "All Year Round", but I'm looking for something better. "All Year Round" turned out to be a bit of a misnomer, and is really not suitable for cold conditions. Even with cloche protection it perfomed poorly. I want the sort of lettuce that will survive -10C and 6 inches of snow! At present my Lettuce crop is limited to what fits into two large pots, and a few individual specimens tucked into the odd corner here and there. These will be used before the onset of proper Winter conditions. These pot-grown ones look nice, but they are growing very slowly, which is not nornally a good thing with lettuce. Rapid growth usually means tender leaves, whereas slow-growing leaves can be tough. I'm not sure what varieties those ones are, because they came from a mixed pack, but I can recognise the "Green Oak Leaf" and I'm fairly sure that the one on the right is "Marvel of Four Seasons". The one seen in this next (close-up) photo is "Delicato". This is also "Delicato", but growing in one of the raised beds, in the shadow of some big PSB and Cavolo Nero plants, so it has been starved of light. Look how pale and "delicate" it is. It's almost as if I had deliberately blanched it. This next one is not a lettuce at all - it's a Radicchio "Firestorm" - but I just wanted to squeeze a photo of it in somewhere because I think it looks nice and more or less fits the theme! Yesterday I was writing about making plans to have more Winter veg next year, and one of my blogging friends - Daphne from Daphne's Dandelions - suggested using the method called "underplanting". This is something I already do in some small measure, but she is right that I could do more. The idea is that you sow or plant your second crop underneath an existing one which will mature and be cleared away before the second one gets big. This is an example of what I have at present - Endives and Radicchio growing at the feet of my Brussels Sprouts. Just to illustrate the difficulty of getting light levels right, have a look at the Broccoli plants in the following series of pictures. I planted six seedlings of the miniature broccoli variety "Matsuri", at the corners of two of my raised beds. One of these beds was that in which my Brussels Sprouts have been growing. The Sprouts were already very big when I planted the broccoli and they have definitely blocked out most of the light - and probably grabbed all the nutrients in the soil too. Tiny flower-head is visible - approx 5cm across! My experiments with underplanting will continue, probably using some less leafy veg next time! Have any of you had success with this technique, and if so, what combinations worked well for you? Tomatoes still continue to figure prominently in our cooking, and I expect that to be the case for a while longer... These ones are being semi-dried. We have had a second batch of Cavolo Nero (which I described earlier in the week) - the first one having gone to my daughter Emma. It's not a big harvest, but you have to consider that those beans all came from two plants. They are not ripe either, so they will spend a spell in the airing-cupboard until the pods go dry and crisp. I brought them in because our weather is damp and still very mild for the time of year - ideal conditions for mildew and fungal diseases various. When the pods are dry and I extract the beans I'll probably have 300 or 400 grams of them, enough for maybe four meals for the two of us. I think I'll keep a few of the best beans for sowing next year, in the hope of getting a better germination rate. I picked the last of the cucumbers too, prior to removing the plants. Just these three "tiddlers", about 6 inches long. Next year I will probably plant fewer cucumbers! This year I initially had six plants, then four (because two died before producing any significant fruit), and the crop was enormous. The variety called "Melen F1" was the more prolific of the two, but the other ("Iznik F1") was good too. While I'm on the subject of chillis (again), let me show you these enormous ones. They are of the variety "Sumher". The longest is 22cm from shoulder to tip. My contribution to Harvest Monday is going to be very limited over the next few months, because I don't have many Winter-harvesting crops. I have decided that next year I will make more of an effort in that area. It doesn't seem right to have most of the garden being unproductive for so long! Maybe I'll gve Leeks another go; maybe try some Swedes; perhaps some Winter cabbages... The big dilemma is deciding which Summer crops will be omitted to make space for sowing the Winter ones.